The past couple weeks, InMobi has shouted a lung-topping THANK YOU! for multiple awards and acknowledgements that have come our way. We’re ecstatic to announce the following awards. 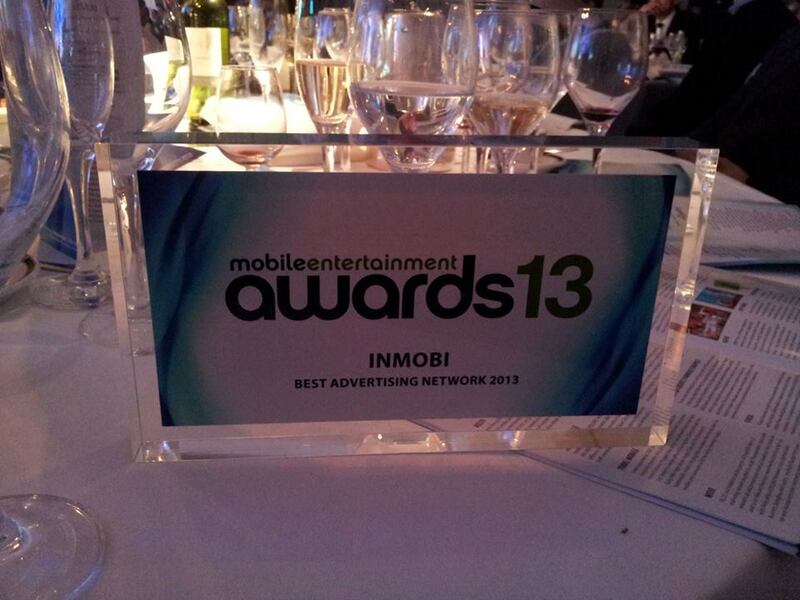 InMobi was awarded the title of Best Advertising Network for the third year in a row at the ME Awards 2013, presented by Mobile Entertainment. There to accept was the InMobi+London team dressed up in their finery and smiles, ready to accept the gleaming trophy. InMobi joined the ranks of companies like Somo for Audi and EA accepting awards that vibrant night at the Royal Garden Hotel. This was the eighth year for the ME Awards. World Women Leadership Congress & Awards (WWLCA) is prepping for their February 2014 event in Mumbai. In attendance this year will be Phalgun Raju, Vice President & General Manager, Japan, Asia Pacific, Brand Business at InMobi, who has been awarded the Women Super Achiever Award. Phalgun meets and exceeds the definition of the the Women Super Achiever Award as it reads, “Outstanding Women Professionals who have the vision, flair, acumen and professionalism to demonstrate excellent leadership and management skills in an organization, making changes and achieving results”. Earlier this year, Phalgun was named one of the top 28 most powerful women in mobile advertising by Business Insider. InMobi CEO and Founder, Naveen Tewari, was recognized with a Distinguished Alumnus Award from his alma matter, Indian Institute of Technology Kanpur (IIT). Naveen graduated with a BA in Mechanical Engineering from IIT in 2000. The award was granted for an excellence in entrepreneurship. Help share the good news and stay up-to-date with all of our exciting news on Facebook, Twitter, LinkedIn and Instagram!